TAMPA MOBILE HEADLINER SERVICE CAN HELP! 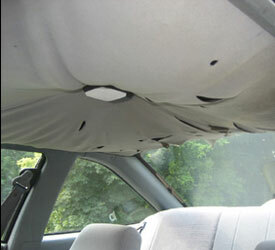 We are experienced in all types of vehicle headliner repair services. Our services start as low as $85.00 and include everything: our travel time, install and all materials needed. Call us today at (813) 466-2751 for more information. We service and repair headliners in the entire Tampa Bay area. Click here: Headliner Repair Service Area for more information about where we service. Is your headliner ripped or damaged from a sharp object, we can help seal and repair both the headliner and foam backing quickly. 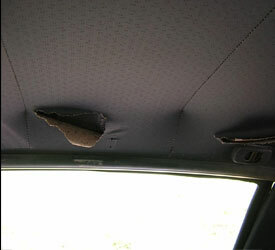 Do you have a torn headliner or cigarette burns in your headliner? We will help repair and refinish the headliner to look like new. Is your headliner falling or sagging? 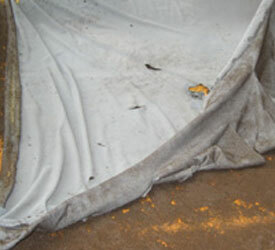 We will help repair the falling headliner & foam and restore the headliner to its original condition.